Doing business is always a serious matter. Remember watching a movie and then one of the characters would say, “I mean business.” Well, that means they’re pretty serious about something. And that is also what it means to do business. It just includes a lot of things in one transaction, like products and services, money, effort, partnership or relationship, honesty, and the most important of them all, trust. Trust is needed among businesses in order to make a good and lasting business relationship. This is one of the many reasons why contracts came into existence and are now widely used in business and other industries. Business contracts are used when conducting business transactions, especially if a deal has been agreed and is about to be signed by all of the parties involved in it. By having a business contract, the parties or the businesses involved in it can guarantee that their transaction is safe and reliable. Making a business contract is never an easy task, just like with all other contracts. It should be written in a way that the terms and conditions are favorable to all of the parties involved and it should also comply with all the legal requirements and procedures to make it into a legal contract. But making it should not be something that one should be afraid of. Having knowledge about contracts will help you to be able to make a solid business contract. 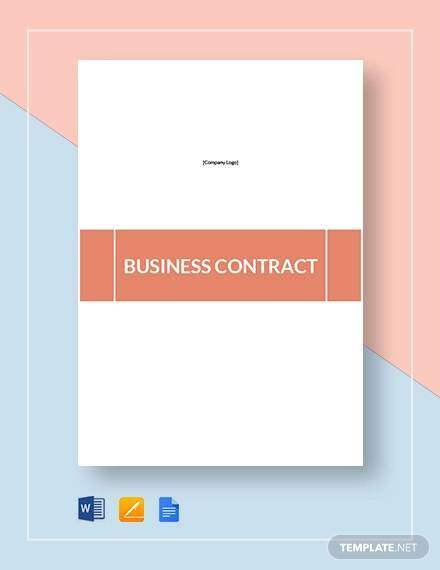 We want to make things easy and convenient and because of that, we have gathered sample business agreement contracts in PDF to help you with making your own. These samples are carefully selected so that you will be able to find the one that best fits your needs. These samples in PDF are available for free online download so you won’t have to spend a single penny. What are you waiting for? Download now! What Are the Benefits of Using a Business Contract? A contract can be an oral contract or a written contract. Regardless of how they are made, they are still legally binding and are sure to be enforceable by law. There are basically a lot of things that you should know about contracts and the contracting world. To provide you with a bit of that information, here are some of the benefits of using a business contract. It provides clarity. A contract provides an outline of what all of the parties involved should expect from each other. This is very important as a little misunderstanding can ruin the entire trusting relationship that has been built by contracting parties. A clear understanding of the contract reduces confusion among the parties and allows them to focus on the things that matter. It is legally binding. Once a party or entity is bound to a legal business contract, they are obliged to follow the terms and conditions that they have agreed upon, which is also stated in the contract. Anyone who violates the contract will be subjected to fines or even lawsuits. You can have a sense of assurance. You can be sure that the other party you are having the business contract with will do their part. This is more than just a promise that they have made when they signed the business contract. They gave their commitment, thus they should uphold it. A business contract reduces the risks of getting yourself into lawsuits. If you know what is allowed and not allowed in the contract, then you will probably know what is best for you. You can definitely avoid the things that will cause you to violate the terms and conditions. And that will save you from breaching your contract. Builds a long and trusting relationship. When a business contract is signed by the parties who are involved, it means that they give their trust to each other. A trusting relationship is important in doing business. It can serve as the main reason why business partnerships last for a long time and ensure the growth of every business. Provides facts. Facts are an essential and crucial part of a business. Deciding on getting involved in a business contract may take a couple of days or a number of weeks due to the negotiation process. The negotiation process includes the many different terms and conditions that the parties must follow as they are stipulated in the business contract. Sets obligation limits. An outline of the duties and responsibilities of the parties involved in a business contract is provided in it to make sure that they know what they should and should not do. A business contract is used as their guide when they conduct business with other businesses, which includes how frequent the service is to be done and the price for the said service. Makes transactions safe and understandable. If a contract is written clearly and concisely, it can easily be understood leaving no room for any unwanted or unexpected confusion. Fear of the unknown is present even when doing business. That is why if both parties understand the terms and conditions in a business contract, then they will have little to nothing to fear. It also keeps both parties from doing other business contracts that will help their companies grow and achieve their goals. Explains how the business is going to be done. One of the things that businesses look for in a business contract is how a business is conducted. An explanation of the business process will enlighten them on the business contract that they are trying to get themselves involved in. Provides a detailed breakdown of the cost and the resources to be used. What better way to know the cost and the resources to be used in a business than through a business contract. Just like lease contracts or land contracts, the cost of services or the products involved in the business transaction should be clearly stated in it. It serves a proof of the business transaction. Through a written business contract, all parties can ensure that they can provide a proof of the transaction when the need arises. This can be used in situations where the other party denies doing the said transaction with another party and refuses to do their part of the obligation, or what is expected of them. You can make sure that the parties involved will stick to what has been agreed upon. A business contract is a legally binding contract and whoever violates it will be subject to legal consequences. Nobody wants to be in a difficult situation, more so being faced with legal consequences. This provides an assurance that the parties are sure to comply to all of the terms and conditions to avoid a breach of contract. Reduces the risks of contract breaches and their corresponding remedies. There are certain remedies for a breach of contract that provides for a win-win situation to the non-breaching party. However, if the said breach cannot be solved by any of the applicable remedies, then the breaching party will be faced with a lawsuit and may need to appear in court for it. Being ignorant of something you want to get yourself involved in will get you to awfully a lot of trouble. The best way to gain knowledge about it is by looking for useful and essential information, as well as using samples to further your understanding. Here we will be discussing the four types of business contracts and their subtypes. We have made sure that they are clearly explained below. 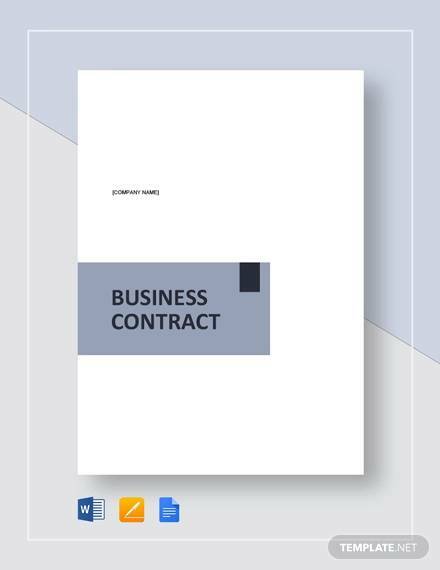 General Business Contract – The topics that are covered in general business contracts are about how a certain business is structured and the protection it gives to the business’s stakeholders. The common types of general business contracts are partnership agreements, indemnity agreements, and nondisclosure agreements. 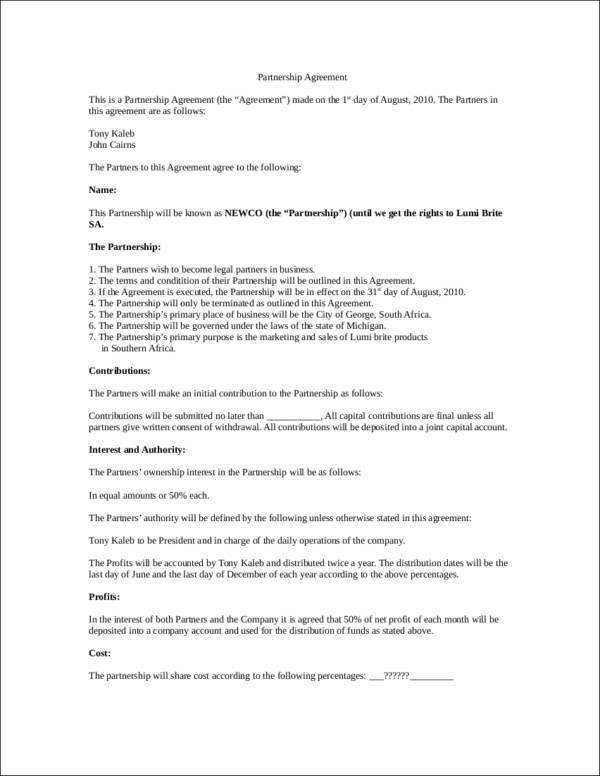 Partnership Agreement – This type of business contract is about the relationship of businesses with each other. It describes the obligations of both parties in the contract, as well as their contribution to the business. Indemnity Agreement – To indemnify is to make sure that someone is secured or free from legal responsibility for a certain damage made as a result of a specific agreement. In an indemnity agreement, one party agrees to indemnify the other party for any damages. 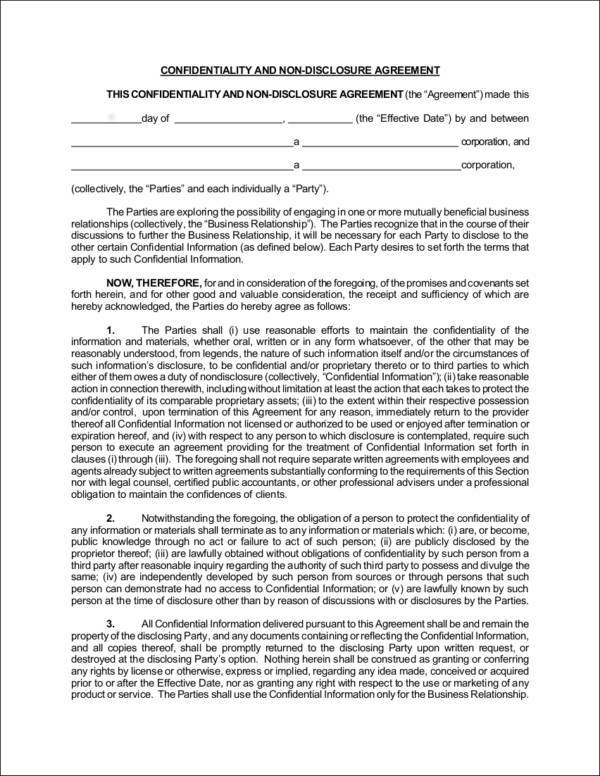 Nondisclosure Agreement – Whoever is bound by this agreement is not allowed to divulge any sensitive, confidential, and proprietary information to anyone outside of the parties who are involved in the said agreement. Failure to do so will have the breaching party face consequences, like fines or serious lawsuits. Sales-Related Contracts – These contracts refer to those contracts that provide details about how goods and services are being purchased and sold. It also provides the outline of the processes being followed when doing land title transfers. Examples of sales contracts are bill of sale, purchase order, and security agreement. 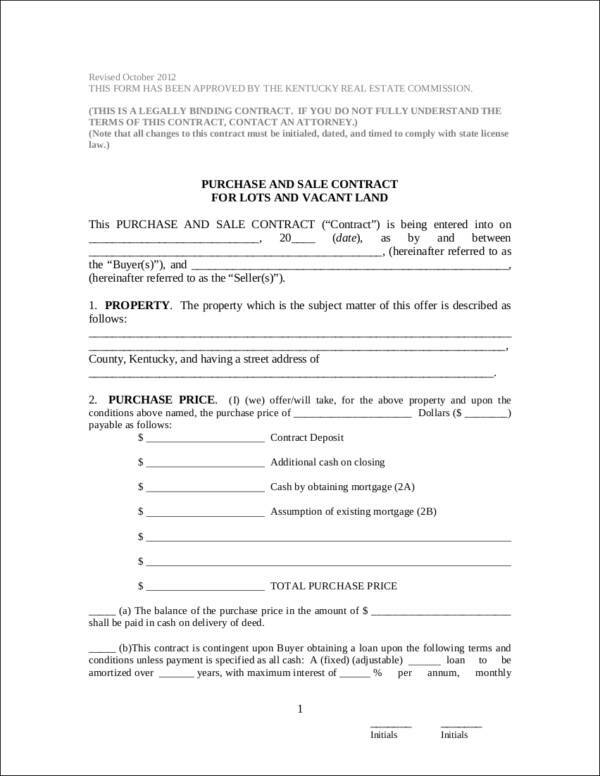 Bill of Sale – It is a document that serves as proof that the selling and buying transaction happened between a buyer and the seller. 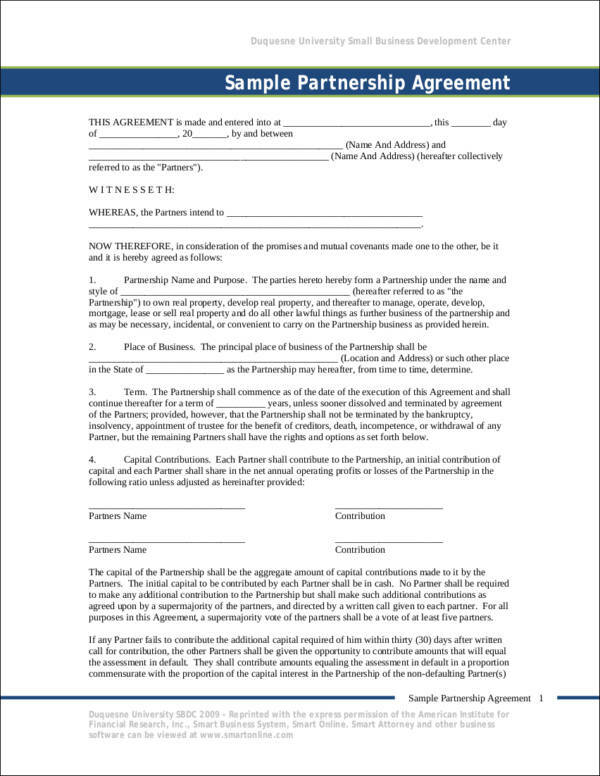 This document is a legal document that states the transfer of a property from one party to the other. 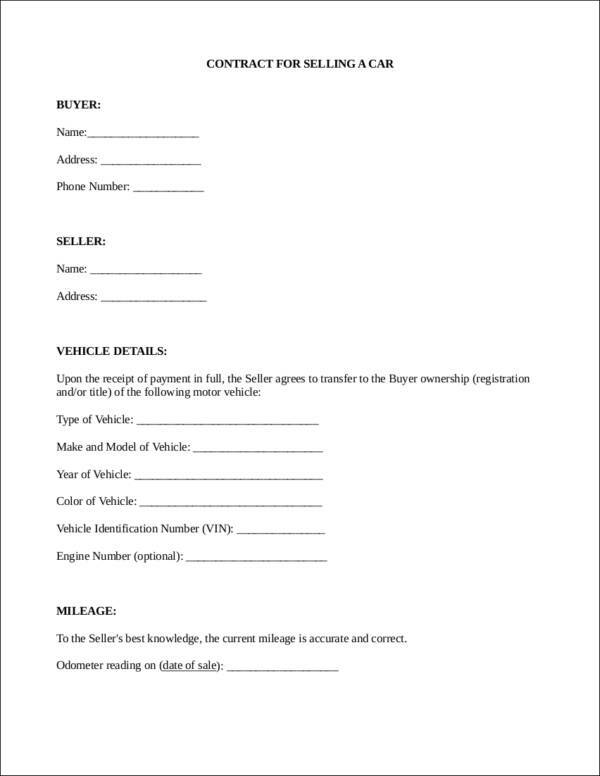 An example of a bill of sale would be when purchasing a vehicle. Purchase Order – It is used when a business owner purchases a certain number of items or goods from another business on an agreed upon price. In this type of contract, the delivery date and details, as well as the payment terms, are included. Security Agreement – This agreement works just like a mortgage contract where a certain property or asset is used as collateral to secure a loan or close a deal. If worse comes to worst, the property or asset being put in collateral will be forfeited to the lender in the event that the borrower defaults. 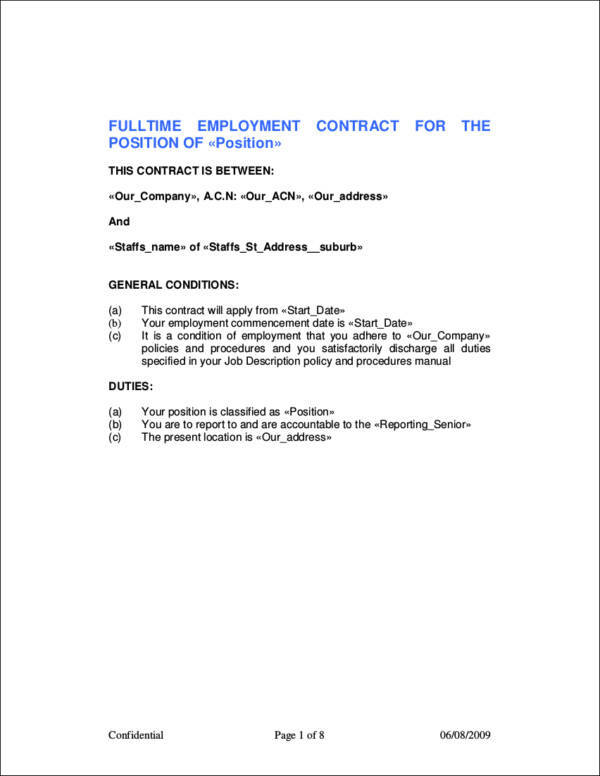 Employment Contracts – This type of contract involves the employer and their employees. The commonly used employment contracts are general employment contracts, noncompete agreement, and independent contractor agreement. 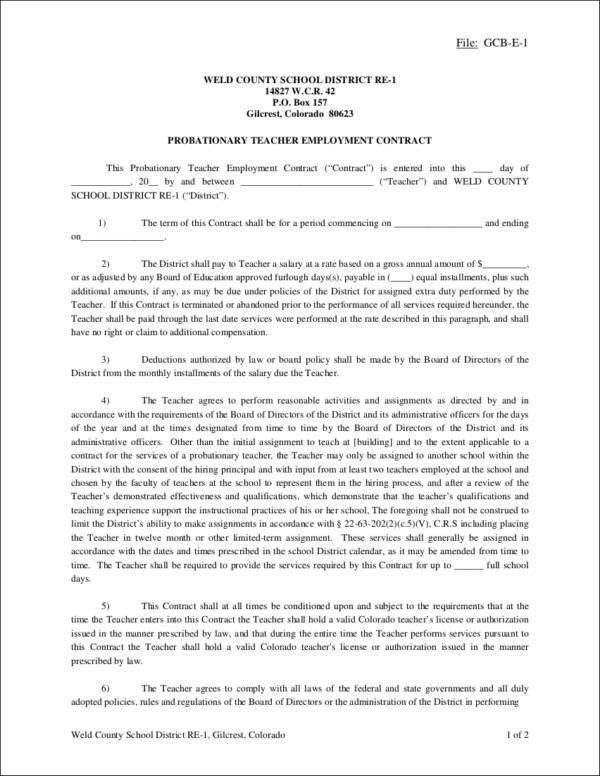 General Employment Contract – This contract includes the compensation and benefits of the employees, grounds for termination, the duration of the employment, and other issues that are related to employment. These issues could be about ownership and work productivity. Noncompete Agreement – Once an employee leaves a company, they are prohibited from competing with that company’s business for a specific span of time that is stated in a contract. For example, an employee from an information technology company left to start their own business. They will be able to do so provided that their business is not in competition with the company, and this is applicable for a number of months or years depending on what was in the contract. Independent Contractor Agreement – Independent contractors are not related or connected to any company and they only work for a person to complete an individual project. 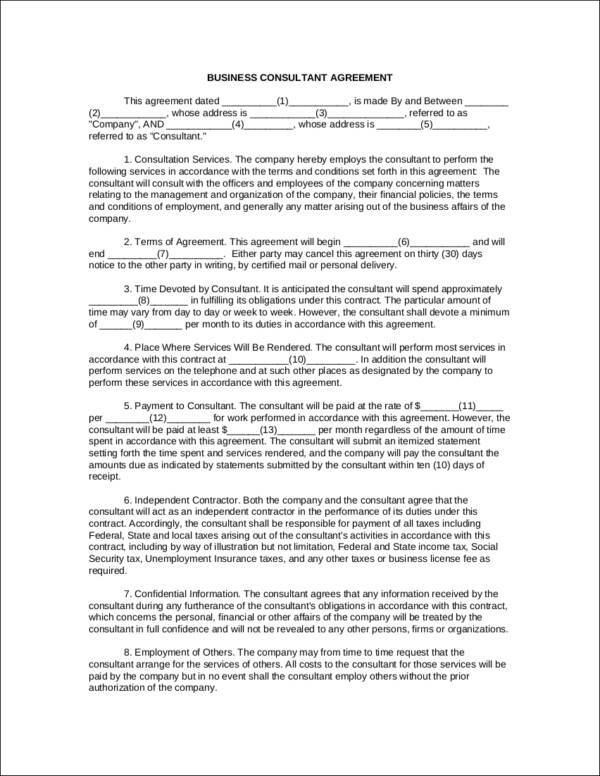 An independent contractor agreement is the agreement used for this kind of transaction or work setup. Lease Contracts – Lease contracts consist of two types, namely real property lease contracts and equipment lease contracts. 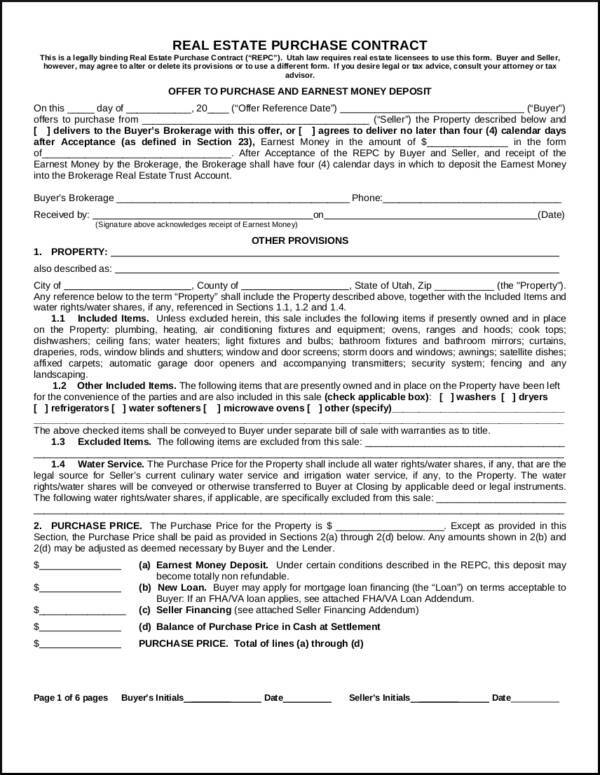 Real Property Lease – It is also called a commercial lease as it involves the lease of houses, buildings, land, and other spaces. 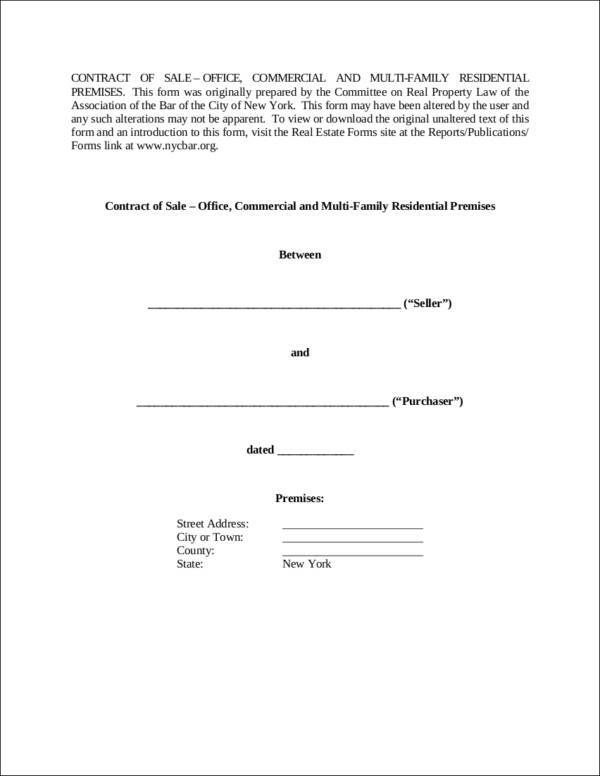 This contract states the rights of a lessee to the property being leased, and the duties and responsibilities of the parties involved in the lease. 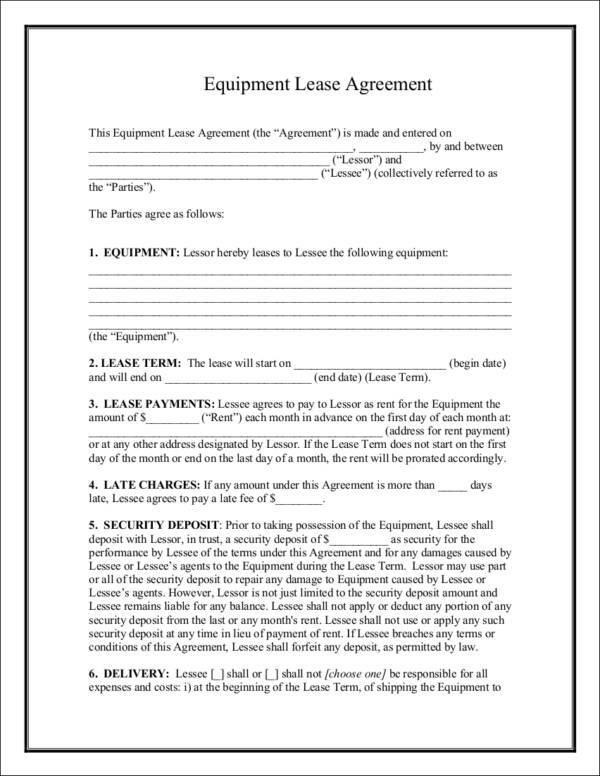 Equipment Lease – The most commonly leased equipment are those that are used in construction. Other examples would be photo copier, vehicles of any type, screen projector, bikes, and many more. Admit it, business contracts are just so hard to make, even with the availability of steps and instructions provided on how to be able to make them. Questions on how to make them effective and solid is still a big issue. This is what makes the task difficult. But you will be surprised to know what things you need to do to be able to make an effective and solid business contract. They are easier than you think they are. 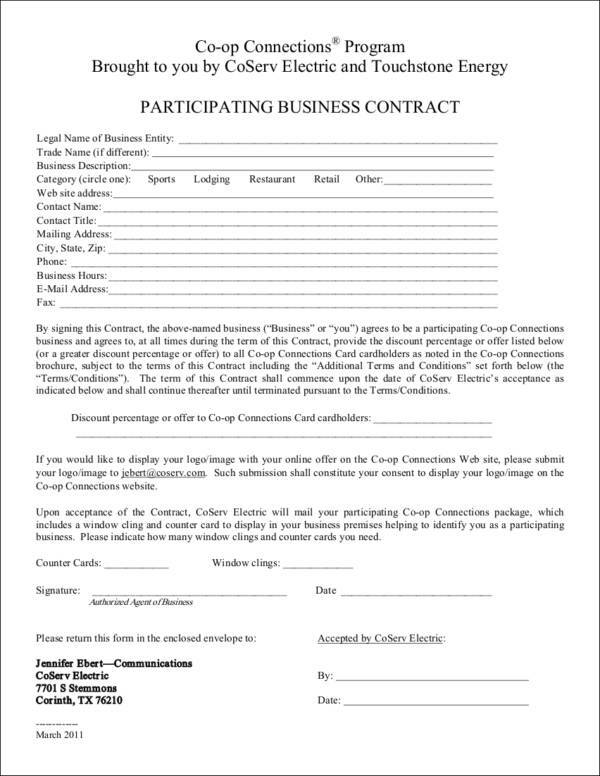 Have your business contract written. Written documents are very powerful tools that are used as evidence if something about your contract goes wrong. Although verbal agreements are okay, it wouldn’t mean that you don’t trust your business partner if you have a written contract done. It just means that you are trying to create a win-win environment for the both of you. As much as possible, keep your business contract simple. Use simple words and sentences to prevent any unwanted confusion and assumptions. Confusion and assumptions might very well lead you to have a bad business partnership and a bad reputation. Do business with the right person. It is very inconvenient to be dealing with a representative of a business who always keeps on getting their boss’s approval while doing business with you. If this happens politely, tell them that you want to directly talk or do the negotiation with the person who has the authority to bind the business. Know the exact name and designation of the parties who are involved in a contract so that you will be able to clearly state the assigned duties and responsibilities of that said party. This might be a very common thing, but it is also one that business people get wrong. All of the details of your contract should be contained in its body. Make sure that you know the elements that make up a contract. The terms, conditions, and obligations of each party should be written clearly in the body of the contract. Make changes as needed before the contract gets signed. Make it a point to check on all of the things that need to be checked and don’t leave out anything. Business contracts will definitely include money and other money-related matters. That is why you should specifically provide the details about the payment obligations of the parties involved in it. For some reasons, money is always a crucial topic to be discussed not just in business, but in other things where it is involved. It is best to have this clearly stipulated and explained in the business contract. Start with the end in mind. We specifically mean the circumstances on when a contract gets terminated. The parties involved should agree on the situation or circumstances that force them to terminate the contract. An example would be if one party misses out on a lot of important things, then the other party would have the right to have the contract terminated. You should agree on certain ways on how you would have disputes resolved. You should talk this out with the other party and get into an agreement on what you should do if something goes wrong. You can discuss having a specific remedy or have it mediated instead of going to court. Choose under what state law you would want to govern your contract. This is useful if the parties involved belong to different states as each state implement their own laws. There would be awfully a lot of problems coming up from this issue alone, so it is best that this is decided before the contract gets finalized. Your contract should be kept confidential. You wouldn’t want confidential information about your business transaction to leak out to the public or to your competitors. A confidentiality statement, just like that of a confidentiality agreement, should be part of your business contract to keep all of your important information and business transactions out of reach of outside people. 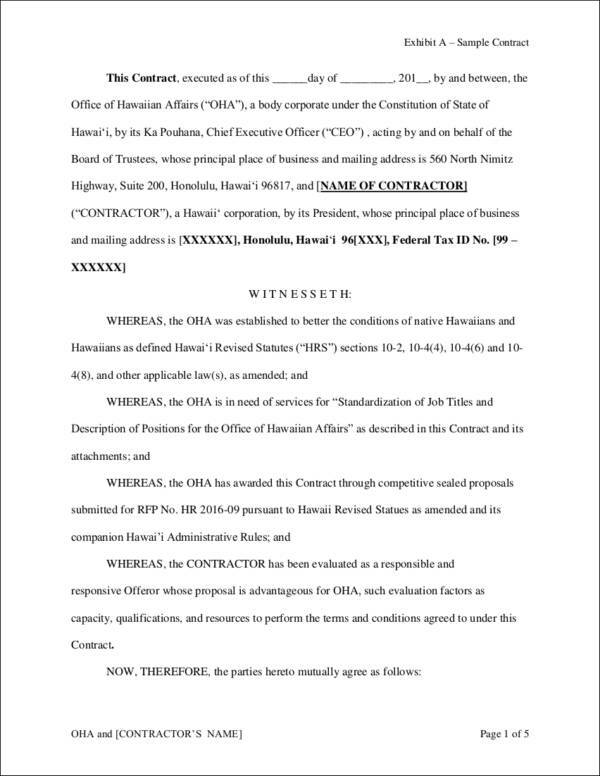 Is It Necessary That All Contracts Be in Writing? We have this thinking that only written contracts are legal and enforceable by the law. This is not true as contracts with verbal agreements are considered legal and at the same time enforceable by law. So regardless if it is written or not, both types can be legally binding as long as the contract being conducted is not something that goes against the law. But why is it that most cases about contracts fail if the party fails to provide a written contract? Choosing what type contract to be used in a given transaction is important to help both parties avoid any legal consequences or avoid fraudulent agreements. Although verbal contracts are legally binding and are easy to come up with, written contracts provide a document that can serve as proof of the terms and conditions of the said transaction. This is the advantage of a written contract and this is mainly the reason why a contract is written, but it is not really necessary. It only becomes necessary to have a contract be in writing when it is something that lasts for a long time or takes a long time to get completed, just like in a lease contract or a land sales contract. 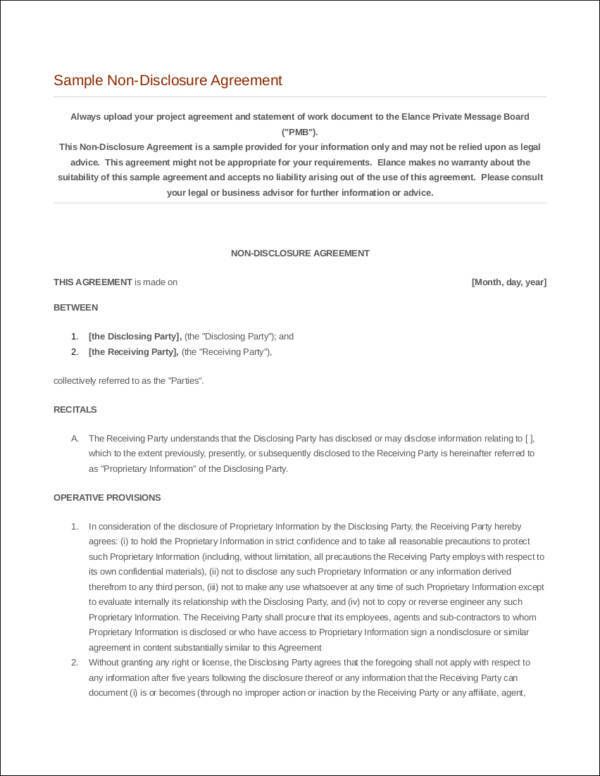 This is when contracts have to be written in order for all of the parties to get committed to it until the full transaction is over. We hope that you have learned and understood something about business contracts. Remember that if you need to know more, you can always check out our contract samples and other contract or business-related topics on this website.